An Honest Review of The Securifi Almond Router – How Does It Stack Up? Finding a router that can cover my whole house without dropping signals was difficult. In fact, I used to have several blind spots on the floor and I had to make myself adapt to them. However, compromising was a short-term solution and with every sudden loss of Wi-Fi signal, my annoyance just increased. That was until I discovered the Almond 3 Wi-Fi Router from Securifi. This is a smart-home hub, which produces moderate speeds and covers most homes easily, without seriously hurting your wallet. It is to a great degree baffling when a video you're watching doesn't stream properly, or when your Skype calls get dropped randomly. Or to even greater despair, when you are working or playing and lose your progress because of a poor signal. This happens because of blind spots in the Wi-Fi signal, which can be fixed using a home Wi-Fi system. It is more reliable and consistent in speed. On the off chance that you find that any of the above-expressed problems are faced by you regularly, then perhaps the time has come to search for a Home Wi-Fi System like Almond 3 by Securifi. We learned everything there is to know about the product and made this Securifi almond review. Securifi has introduced the Almond 3 as its first ‘Wi-Fi System’ for the smarter home. The Wi-Fi routers used in the system are midlevel 802.11ac, which are adequate for domestic purposes. The device is quite user-friendly and has numerous features discussed below, which keep it a touch above other trending competitors. Depending on the size of your home, you may want to have a single router or up to three routers. A single router is great for a small home. For a medium to a large home, you can make use of Almond’s mesh network, which includes an additional two routers. The first router acts as a main, while the other two become extenders and ensure that your whole house is blanketed with strong signals. Together, the network can cover up to 4000 feet with a strong and reliable signal. The Wi-Fi system is great for anyone who wants to use the internet for residential purposes i.e. casual streaming and video chatting. However, do note that the routers provide a moderate speed and you may not enjoy a high-quality experience while playing games. The units come with a touchscreen interface which is a huge plus. It makes the initial set up pretty smooth and doesn’t require any external device. Moreover, the units have been integrated with voice activation, based on Amazon Alexa. This means that the product is going to work with all the Amazon Alexa products such as the Echo or the Tap. The activations are linked to controls programmed in the routers, which have been labeled as ‘scenes’. The ‘scenes’ can be set by you to activate shortcuts. For instance, music and lights can be tuned to set‘ party scene’. Similarly, bedroom lamp and thermostat can be started by setting ‘sleep scene’. Once set, you can just say ‘Alexa, tell Almond to activate sleep scene’, and you will find your bedroom getting prepared for your sleeping time. What is even exciting is that you do not have to be clumsy and state each command separately, as with the group control, you can call for door unlock and lights on at the same time. The Eero Wi-Fi System can provide consistent Wi-Fi signals that cover the complete footprint of most houses. The unit is all around composed, simple to utilize and you can rapidly scale up your home system by including more units. The framework is costly, not sufficiently quick for high bandwidth tasks and obliges you to connect with Eero's servers to oversee it. Compared to Almond, components are negligible, with just two system ports and a single USB port is futile at dispatch. While super advantageous and solid for Internet sharing, the Eero only provides a moderate speed like Almond 3 and is not suitable for heavy users. Learn more about it here. The Orbi Wi-Fi system advantageously conveys expansive Wi-Fi signals without bargaining speed. The system doesn't require any linkage with Netgear to work. The framework is costly, and there's no mobile application for its setup procedure, unlike the very user-friendly Almond 3. If you ignore the high cost of Orbi as compared to the Almond 3, the Orbi System is a certain and simple approach to cover a generally extensive home with fast Wi-Fi scope. The Luma Home Wi-Fi System is intended to extend your remote system to all parts of your home. It's anything but difficult to set up. Moreover, Luma makes it simple to welcome clients to a visitor arrange and to make filters for every client, which is a feature Almond 3 lacks. The framework conveyed great results near the hub throughout our testing, however, we found that execution dipped as we moved from the hub module. In addition, control choices and ports are constrained. Overall, the product is expensive, and execution is mixed, compared to Almond 3. The devices in the Almond 3 mesh network can all act as routers, access points or extenders. The first unit becomes the main, the second unit becomes an access point and the third unit becomes an extender. The network settings are automatically duplicated by each of the units, allowing for a seamless interaction. The networks can themselves be interlinked with up to five branches. According to the company, the signal coverage for a single unit is 1300 feet while for a whole mesh network is up to 4000 feet. The network ports include a Wan slot and two Gigabit LAN slots. The Almond 3 comes with a geofencing feature that will start or stop your linked actions when your mobile phones IP address is within the geolocation. To make this possible, the network has an application for Android and iOS-based phones. The application sends the IP address and calculates the GPS data to ensure that there are no false activations. The app also allows you to control the network without being actively present in it. Moreover, there are modes of parental control, which gives you the ability to pick and choose the scenes to activate upon command. The Almond 3 is a great addition to modernize your home, being already programmed to interact with home automation services. The biggest of these is the ZigBee and the Z-Wave, which have almost a hundred different sensors for making you capable of controlling things like door, windows, garage, lights, heaters, etc. There are several brands which manufacture products to align with the automation services, including some very popular ones like Belkin, GE, Phillips, Schlage, and Kwikset. The Securifi Almond box is very small in size and inside you will find just a few items, the modem, a power adapter, an Ethernet cable and a setup instructions card with four steps to follow. It's to no surprise since this was the concept from the beginning. Create something that's ready to go in under three minutes. 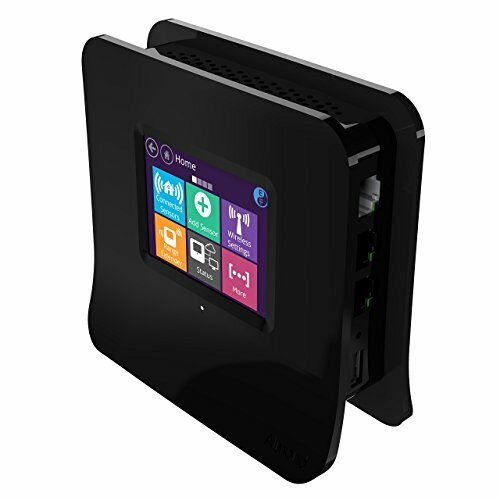 The Securifi Almond has four internal antennas and a 2.4 GHz band with a data transfer rate of 300 Mbps. As far as power requirements are concerned it requires AC 120/230 V. It's compatible with Android, iOS, and PC. It can get super annoying to lose Wi-Fi signals in your home. While it may seem okay to stick up to the problem if the issue is temporary, however, if the signal loss is persistent you should find a solution. This is where the Securifi Almond Touchscreen Wi-Fi Wireless Router can play its part. It is an impressive product with a moderate price and a large signal range, which can easily cover most houses completely. It is a hassle-free product and is perfect for you if you are a casual internet user and want to get the most out of your purchase. Moreover, with a one year warranty, you get one of the best purchase security compared to other competing products. Click here to find out more about the Almond 3. We hope you liked our Securifi Almond review and if you'd like us to review a specific product send us a message. We are always looking for ways in how we can help people.